The virtual phone number made for entrepreneurs. Convert your leads to sales - with a business line designed to double your revenue. Share your business number with 1-5 employees, all from your smartphones. Almost half of all sales go to the vendor who responds first. Ninja Number is a revolutionary evolution in how entrepreneurs handle calls. Ninja Number is the ONLY virtual phone system that allows up to 5 people to share the same number. Calls automatically ring all linked phones. 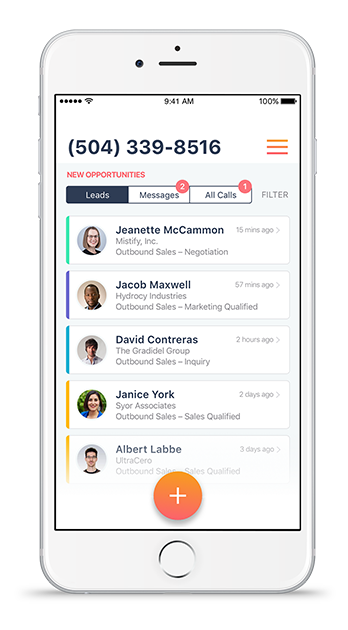 Employees can all call, text and review messages from their smartphone. Ninja Number uses artificial intelligence to auto-respond to texts and voice mails. And it reminds you to return phone calls. Ninja Number can double your sales by making sure you return phone calls in the first five minutes. Help increase sales by improving your response in first 5 minutes. Ninja Number can auto-respond for you and will remind you to return calls. Share your line with up to 4 other partners or employees, so you don't have to purchase extra phone lines for each employee. Leverage artificial intelligence to automate customer interaction, provide insights, and make recommendations. Learn who to call back first. Ninja Number will automatically tag calls as sales calls, regular customers or VIPs, or you can tag them yourself so you know which phone call to return first. Get insights to help your business. Learn how to improve your communication with customers so you can grow your customer base. Four apps in one. You can let Ninja Number handle voicemails, call forwarding, 24/7 hotlines, and multiple extensions. Try Ninja Number for Free! Our blog, Ninja Tactics, gives you tips and advice on how to grow your business.